I think that the concept of creativity has been the point of discussion here at this website, especially this week. Is there a toy that can inspire creativity? Is there a toy that can help you be an independent thinker? I don't believe any toy can do it all but if you wanted a tool to plant creativity, fertilize it, nurture it, and most of all, retain it..... then consider trying the Tegu Pocket Pouch Prism set. If you ever want to teach your child how a little can do a lot, this could be your best shot. Blocks help kids be creative. We all know that. So more blocks equal more opportunity for creativity, right? But the Tegu Prism set only comes with six blocks and you might see that as limiting but don't be fooled. 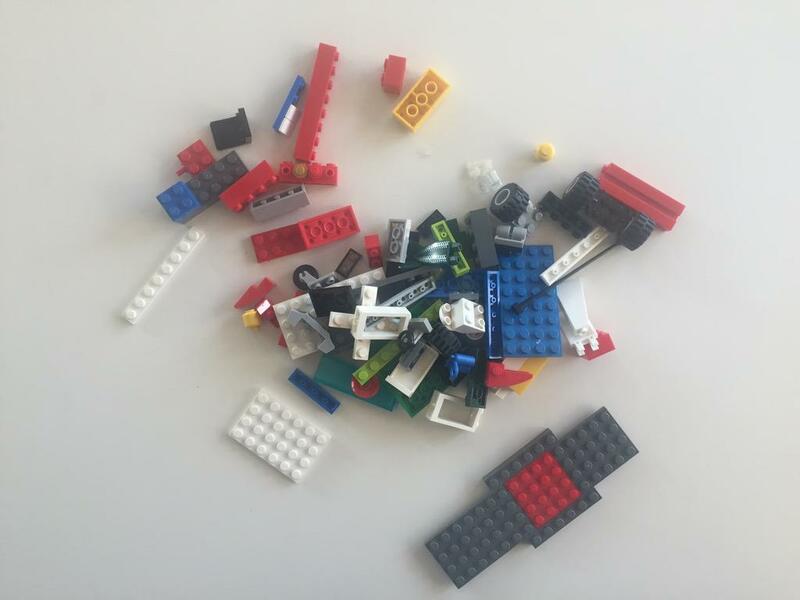 It can also be argued that toys that work best when there are many pieces could somewhat possess its own limitation of needing more to do more. So why is this set of six blocks in triangles and parallelograms so great? Why would I buy them rather than a set of 100 wooden blocks? To Number 1 Son, I have told him over and over again these words: "Your blocks have energy. They are shapes that contain a force inside of them.... you know, kind of like batteries but the energy doesn't die." Okay, I am getting a little weird.. so let's bring in an expert on all things creative- Petra Pankow, a museum arts educator who teaches in globally-recognized museums such as the Museum of Modern Art , the Guggenheim, and the Museum of Art and Design. Petra has children of her own and has played with tons of blocks and magnetic toys but never experienced Tegu's products until I asked her to take a look at the Prism. She really liked them a lot. "First of all, the magnets don't necessarily work in the way that you expect them because they attract and they also repel." After seeing her five-year old daughter become a little frustrated with the Prism, Petra saw the quality that all of us hope to find in a toy. About the Prism she said, "It kind of asks you to think outside-of-the-box and think around the corner in a way." She said that a child would end up not stacking so much, rather the gestures would be created by turns - "like a Rubik's cube." "I think it has a lot of potential just because it's small," said Petra. She is right that it is small. You hold it in your hands and of course they won't fall out because they're stuck to each other. Petra also noticed that the magnetic quality meant that you were building in reverse, meaning, you don't have a plan and then as you build, you actually see your plan come to life. "I think they might sort of snap together in unexpected ways and it does sort of look like a little block formation or like a tree or something like an animal...." she continued. I think I know what she was talking about. Some people can really just see things. When I was younger I could see faces in a corkboard. (Don't ask) It's all about being able to see something from a bunch of lines and shapes. Petra described the thought pattern to sort of sound like this, "Oh, this looks like an animal, if I turn this and then it's going to look like a tail." Petra continued, "You have to use your imagination a little more. I'm definitely a big fan of reverse gesture of building." 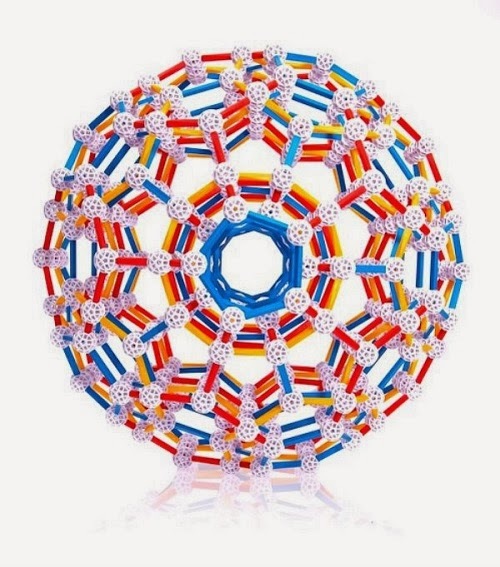 As noted with toys like the Oblo Puzzle Sphere, when you have a toy that is beautiful, you are more likely to get past the frustrating part of getting to do what you want if the toy itself is pleasing to your hands and your eyes. And if beautiful design can motivate a child to keep going then the Pocket Pouch Prism sets are going to meet the need in this department. "They're such beautiful toys," said Petra. She looked at the Pocket Pouch Jungle Prism that has a couple of tinted shapes. She appreciated the tactile feel of the blocks, the stained wood, the ability to see the wood grain, and she liked that there were two different shades of brown in the Jungle Prism set. "It's more nature. It's an unusual color scheme for toys which I think is really nice." Petra also felt that there was a very organic quality to them that made a difference in handling it too. I think she's really right about that. My kids are more gentle with this toy. "That's all very subtle stuff. There is a certain enjoyment that comes out of that." But if they are turning and twisting and feeling like they aren't going nowhere, what could you say to children to help them work through any possible frustration? Petra suggested that we should just ask the child to take one of the shapes and see how it picks up the others - to just leave them out and see what happens. "And once you have them combined to really use a rotating movement and to really get away from the idea of stacking because the frustration lies there. These magnets push and pull in a certain direction. You have to surrender a little to that. That might be difficult for kids to do but once you get into that mindset, it's actually really fun," said Petra. I have thank Petra so much for opening my eyes to all the gifts that can surface through the process of making art especially for Number 1 Son who is a maker, a mover, a shaker, not a sit-downer for sure. She talked about how in some of her classes at the Museum of Art and Design, there would be a child who couldn't sit still to listen to the instruction. She continued, "and then we go back and start making things, [and looking at] especially those kids who have a hard time sort of concentrating.... they sometimes end up making these amazing creations." Petra believes these skills and talents are indeed important. "I mean to be able to think about space, and about things in space and movement," she explained. Petra emphasized this element the most, "You have to let go. You have to let your imagination run wild.'" Petra thinks that the Prism set is also great to discover geometry and math in a less academic way however, academics are only part of the process. "In the end of the day, they can know so many things about math and language," said Petra but she advised, "If they don't have ways to use those skills creatively, they can only go so far." I would like for Numbers 1 and 2 to go as far as it makes them happy. I think Number 1 is pretty ambitious and so I'd like for him to practice using his creativity (as long as it doesn't make a mess at home). 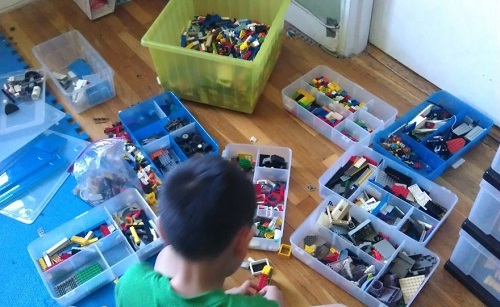 One thing I learned from reviewing toys and really looking at kids playing is that it is so much easier for kids to make connections about how creativity is valued in the adult world by using their own toys as a lens. You can talk to them about design and designers and college and the work world by using their own toys as the bridge to broader knowledge. It's easier for them because they can hold it in their hands and have a vision of what you might be describing. I humbly believe that it can have a great impact if we share this information with them. Speaking of impact, my kids' Tegu toys were used in my home to discuss every kid's favorite topic: corporate social responsibility!!!! Okay, maybe that is my favorite topic- actually, my favorite topic these days is: RESPONSIBILITY. But while talking about Tegu's commitment to the environment which is a concept they've already learned in school, I can use their toys to talk about that and then introduce my ideas of what responsibility is- in the least annoying way possible because remember, they are still just sitting there playing with their toys. Corporate Responsibility and Personal Responsibility- Hey, that rhymes! Hmmm.... Creating and Fertilizing New Life and More Education and Jobs? These are all good lessons to learn and they can remember that every time they play with their Tegu toys. For Tegu, corporate social responsibility is not something on the side that they hired a PR agency to do because they have budget for that this year. Rather, Tegu's brand has everything to do with the work they are trying to do in the Honduras (jobs and education and sustainable forestry). Read Jonathan Liu's interview featuring Tegu co-founder Will Haughey on Wired's GeekDad Blog. Read it to the kids and watch this video (below) with them. It's really hard not to cry. Guess what? I just found out about a sale and promotion for the Tegu Pocket Pouch Prism. You could win one Prism set by telling the Tegu Team where you’ll take it this summer. Between Monday and Wednesday (5/23), share your travel plans (and this announcement) on Facebook or tweet @Tegu with the hashtag #MagneticToy to enter. A winner will be selected at random and announced on Friday on Facebook and Twitter. Can't wait that long? Well, you're in luck. Use the discount code TEGUPRISM to receive 20% off any Pocket Pouch Prism through Wednesday May 30!- good luck everyone! Disclosure statement: Toys are Tools has not been compensated in any fashion by the manufacturer or retailer of any of the mentioned products for the publication of this post. A set of the Pocket Pouch Prism was given to Toys are Tools to facilitate a review. Reviews are never promised. Looking to buy your own through Amazon? Here's a link through Toys are Tools. Click the photo. I like this toy and you are right - the grownups will want to use it, too. These could make a great study break for tutoring students as well as a fun take-it-with-you game.